Saving money doing laundry? You're all in when you toss in the Ecoegg to your wash. 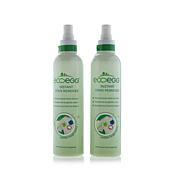 It works without harsh chemicals while minimizing residue on your clothes. And there's no detergent mess to worry about. This bundle cleans up to 864 loads — enough to do approximately four years worth of laundry for the average family. That's savings you can take to the bank. Fragranced version may not be suitable for people with fragrance allergies. 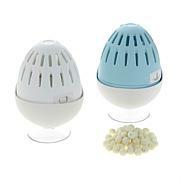 Rinse residue off Ecoegg before each use. Love it and it works great! I save so much money on detergent. Im really glad I purchased this. I really wasnt expecting anything fromthis product I just wanted to save money on laundry detergent. Ive been using it and it leaves a nice light scent and cleans my clothes quite nicely. I would recommend. I have done about 3 loads of laundry, with the color one and 3 loads of laundry, with the one for the whites. Very pleased. I also the holders they fit in. I have them on the side of my washer. Thank you Home Shopping for bringing them . I was a little skeptical at first ,but after my first wash I really could tell the difference. The ecoegg really does clean your clothes. Saves a lot very happy with my Ecoegg !! This is a simply wonderful invention! My clothes are clean and have a fresh, but not overpowering scent. I also added the scent booster to sheets and LOVE the lasting freshness. I am sensitive to many products but find I have no issues with this one! 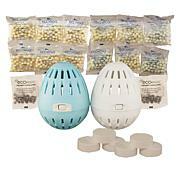 I am washing my clothes with these Ecoeggs from now on so keep the refills in stock HSN!